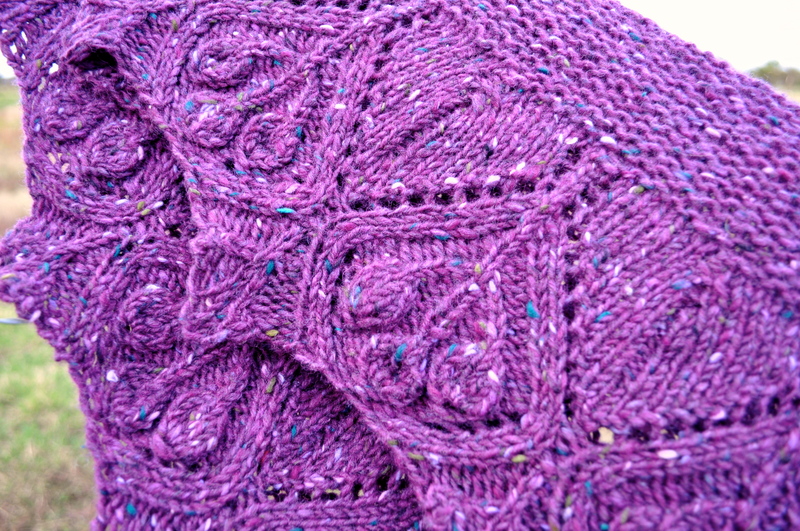 A couple of Christmases ago my friend Kristen gifted me two skeins of a very pretty purple tweed that she got on her trip to Ireland. It took me a while to figure out exactly what I wanted to do with it, but eventually I came to the realization that it was meant to be a Hawthorne. 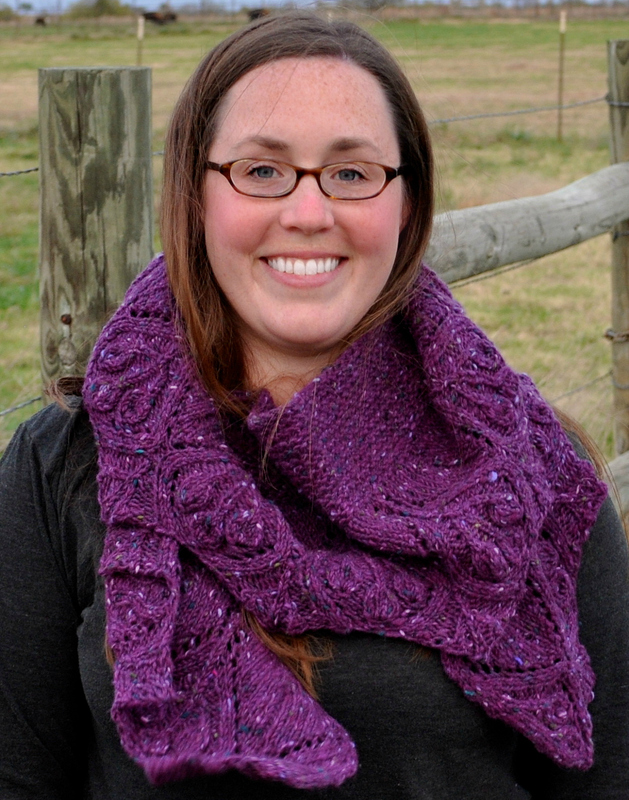 Hawthorne is a gorgeous shawl pattern from twist collective that has a shallow semi-circular shape and just looks so cozy with lace and garter stitch. 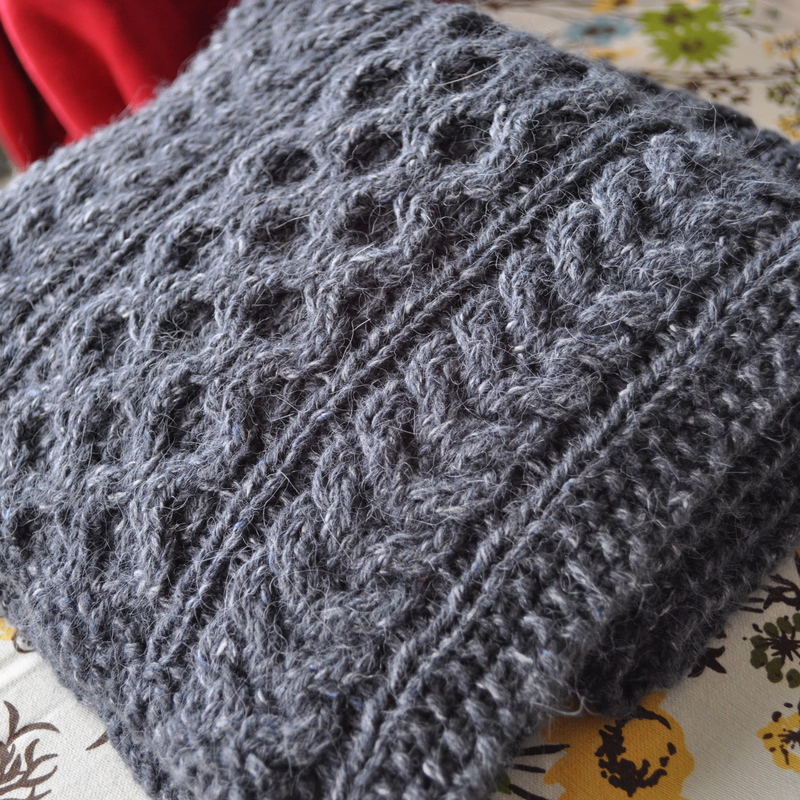 Both the pattern and the yarn had been percolating around my head for a while with me not quite sure what to do with either until one day it all came together and I realized my Irish Donegal tweed was perfect for this lovely pattern. 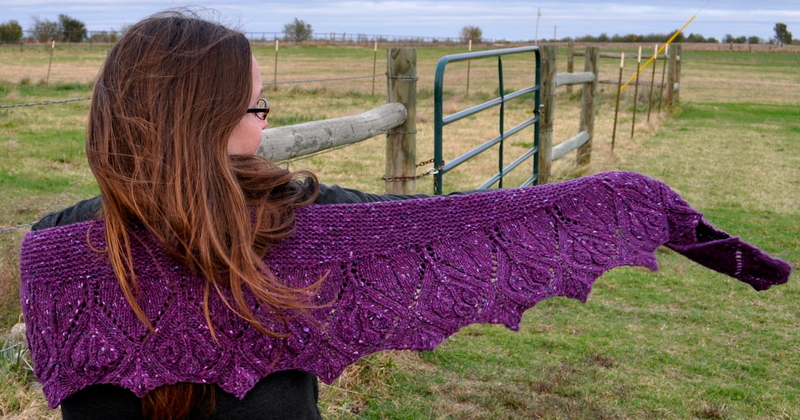 This shawl has an interesting construction – you cast on at the lace edge, work the lace section and then use short rows to create the semicircular shape. 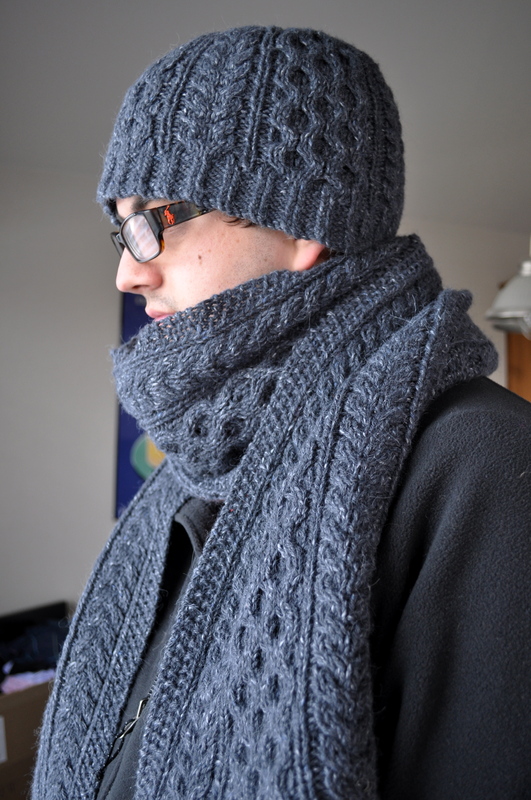 The pattern is very well written and easy to follow, but, through no fault of the pattern, it gave me tons of trouble because I didn’t have quite enough yarn to complete the garter stitch section as written, but I wanted to use every bit of it – which means I reknitted that section, like, five times to try to get a combination that gave me enough yarn to finish, but still had the deepest garter stitch section possible. I literally had no yarn left over! After casting off, I had maybe one and a half inches to weave in! 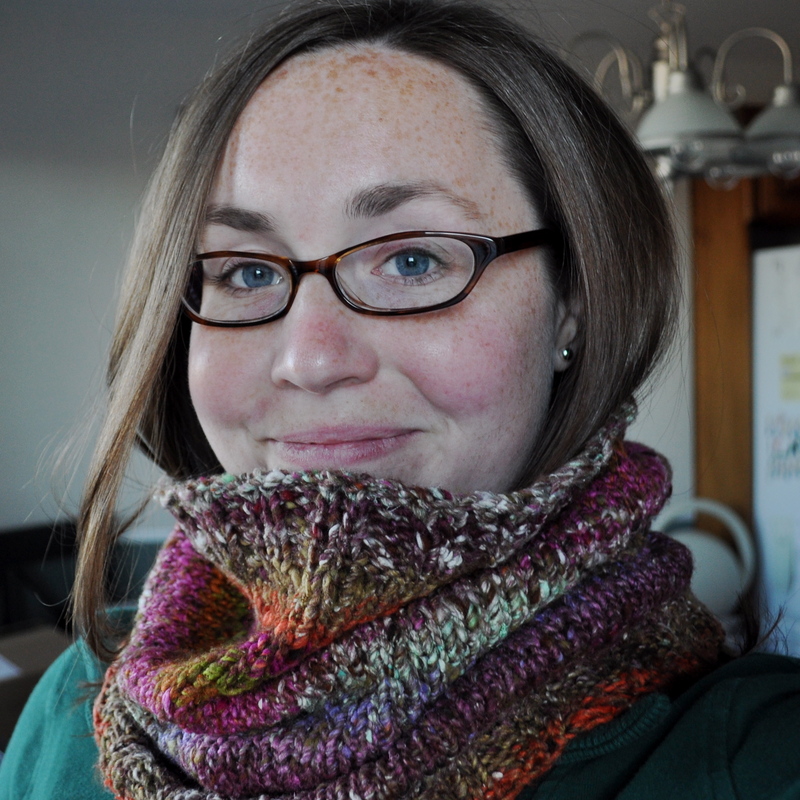 I love this shawl, it is so cozy and the yarn softened up quite a bit after blocking. 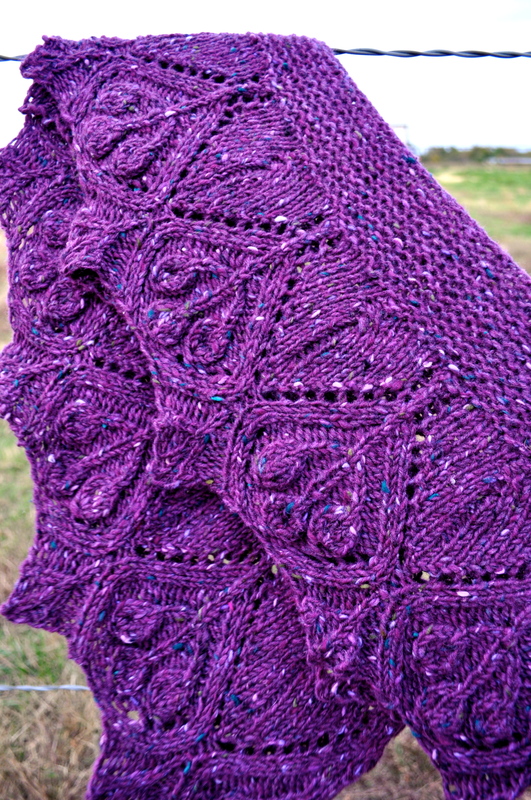 The different construction of the shawl was really fun – this was my first of the new super popular crescent shaped shawls. I really love the shape and I think it is ideal for casually looping around your neck a couple of times. Very, very pretty. Thanks for the yarn Kristen! At the beginning of last week I took a two day (work-related) trip, which was great timing knitting wise because I needed a little break from Sabbatical (get it? sabbatical from Sabbatical? ha!) I’m loving how the sweater is turning out, and my speed has definitely increased now that I’m more used to the lace pattern, but it’s still a little bit slow and I wanted to knit something fast! 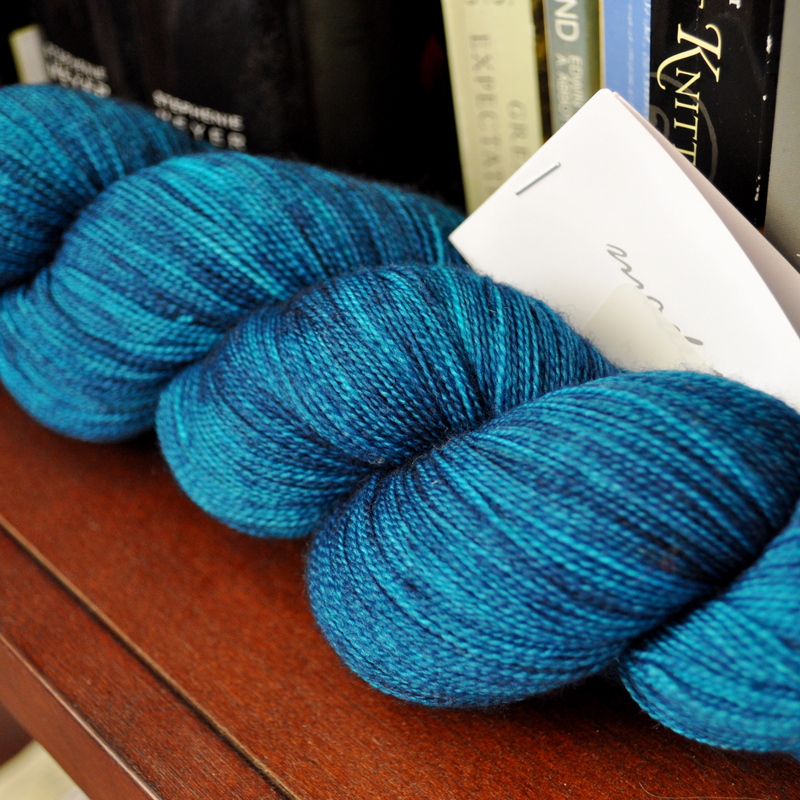 I’ve had one hank of Three Irish Girls Kells Sport Merino almost since the moment I voted in the Dye for Glory competition on Ravelry and fell in love with the Estuary colorway (scroll through this post for all of Three Irish Girls Dye for Glory colorways – gorgeous!) (I might mention that I also fell in love with the Georgia Peach colorway and ended up with two hanks of Adorn Sock in it). I’ve been at a little bit of a loss for what I wanted to do with this single hank of Kells Sport – I only knew that I wanted it to be made into something that would reside around my neck! Enter Cat Bordhi’s Moebius cast on. 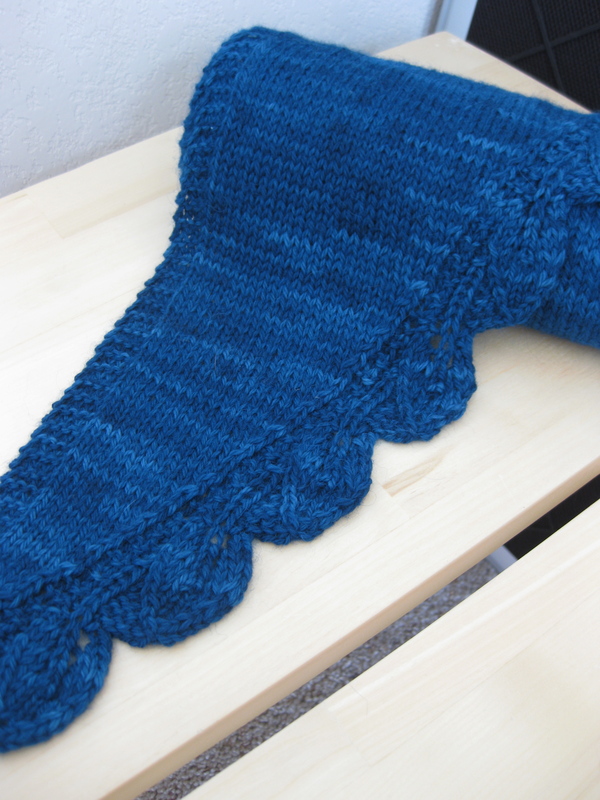 I realized that a simple garter stitch mobius – blocked to a really loose fabric so that it would drape nicely – would be the perfect fit for my Estuary yarn. 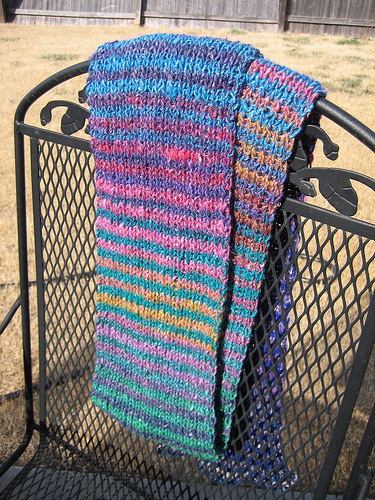 I decided to double the yarn to get a thicker fabric and sort of mix up the colors. 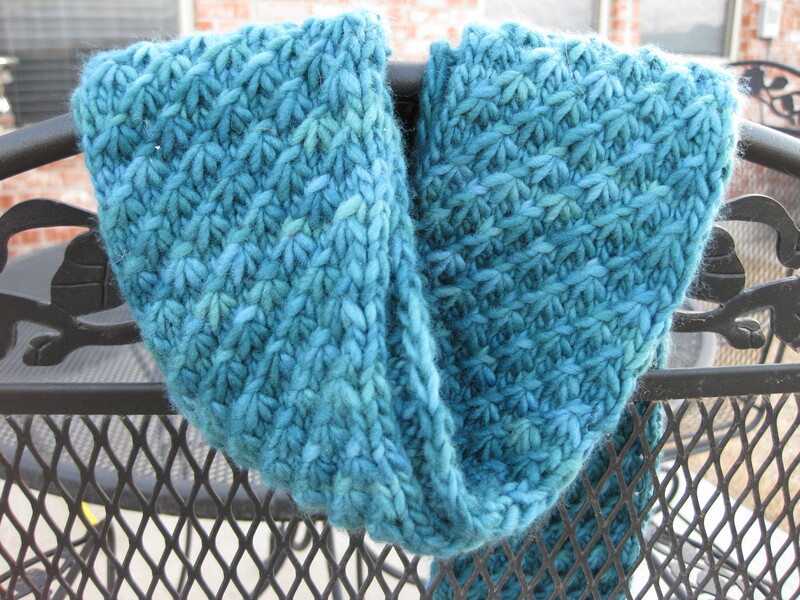 For my mobius, I cast on 150 sts (which in the moebius cast on means you really have 300 sts), and alternated knit and purl rounds until the yarn was gone! When I finally cast off, the loop seemed really tiny, but after aggressive blocking it came out almost exactly as I imagined it! 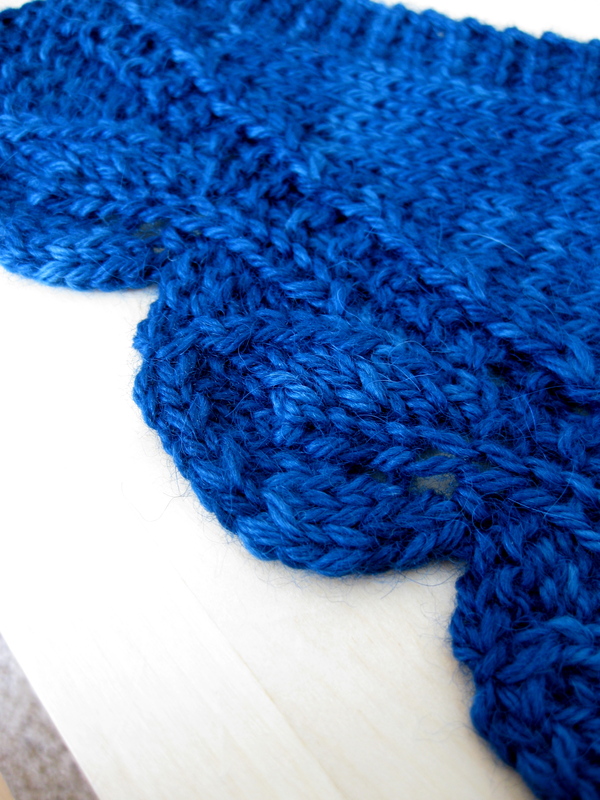 I think doubling the yarn and stretching the garter stitch gives the impression of a more complicated stitch pattern than I actually worked. Cat’s Moebius cast on tutorial is wonderful, and made the kind of mind boggling process completely understandable! 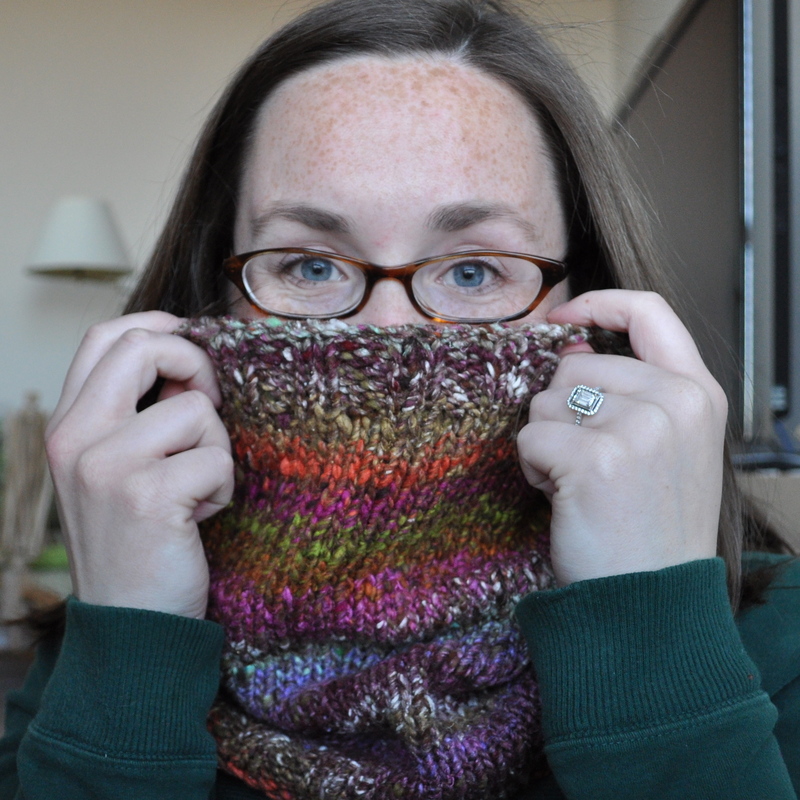 So, in summary – love the cast on, love the yarn, love the finished product! Since I was traveling last week, I had to bring along a small project to work on the plane ride(s) and in-between visiting with family and friends. Owing to my nature (as a last minute packer), I didn’t really plan ahead and had to comb through the stash and Ravelry to find an appropriate project the night before departure. 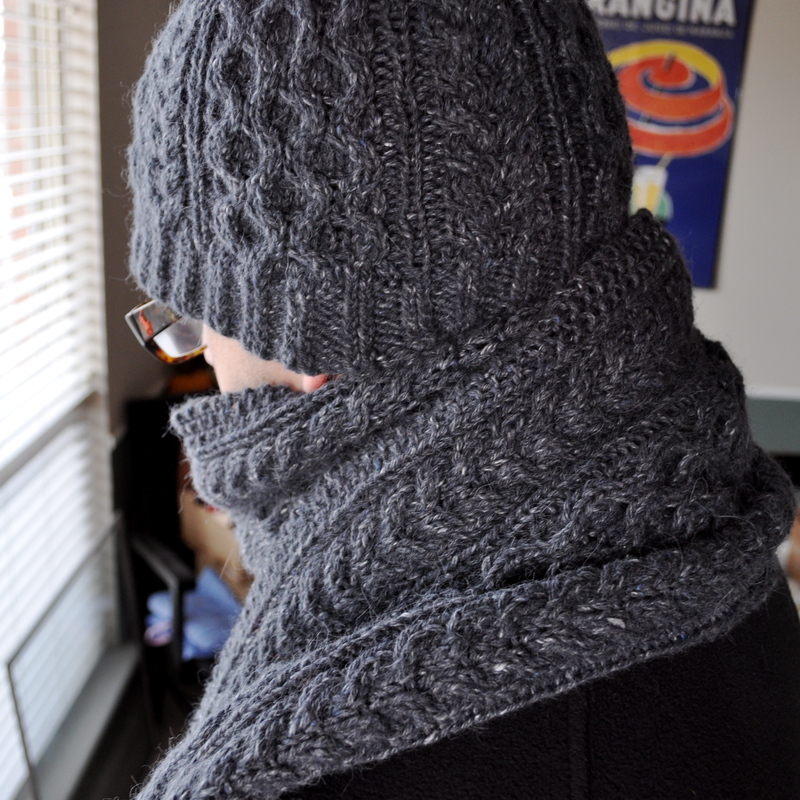 I came across this adorable pattern – Saroyan by Liz Abinante. 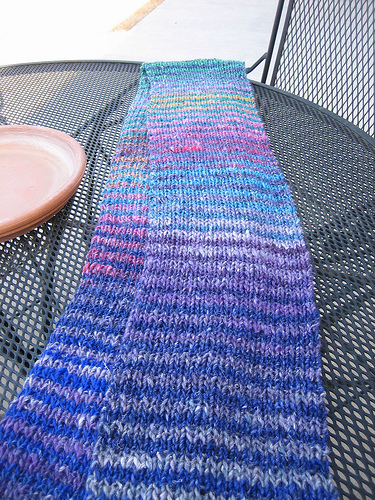 As I mentioned before, I decided to knit up this little scarf in my Peacock ShibuiKnits Baby Alpaca which was acquired while in Portland for E’s wedding. 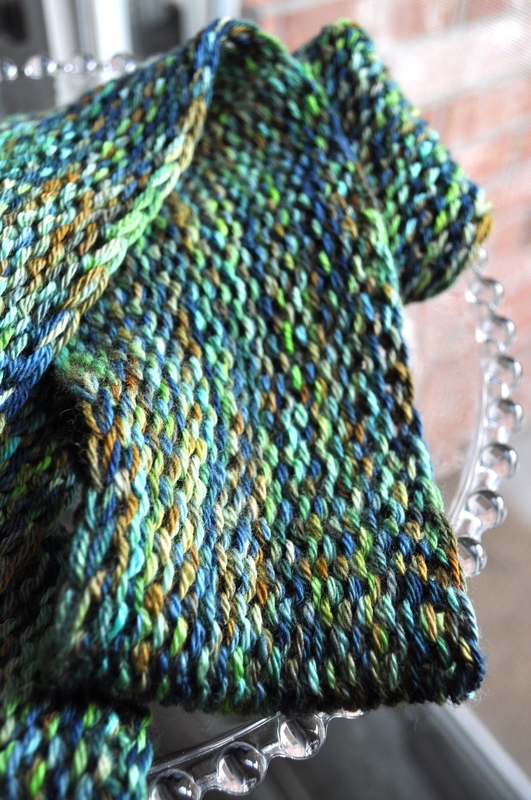 I think this pattern is really very pretty and that it looks especially nice in a slightly variegated green yarn. The leaf repeat is fairly easy to memorize after working a few, and I love patterns where I can complete little milestones along the way (one leaf, two leaf, three leaf . . . ). 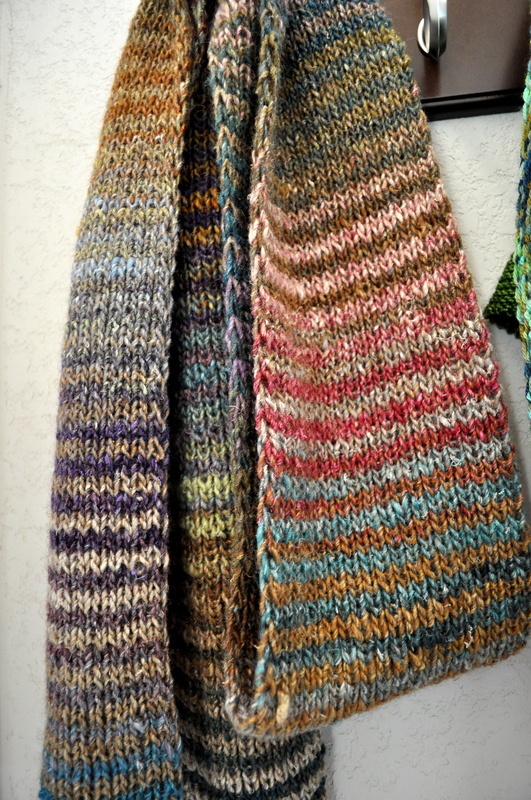 I decided that I wanted to make a really long scarf using all of my yarn, and that I wanted to make the transition between the increasing/decreasing sections and the straight section more gradual. The details: I worked 7 repeats of the increase section as instructed in the pattern and then one repeat increasing only on the first, seventh and thirteenth rows. I worked straight for 20 leaf repeats and then mirrored my increase section for the decrease section. The only other minor change was to not work the “stem” on the final leaf. 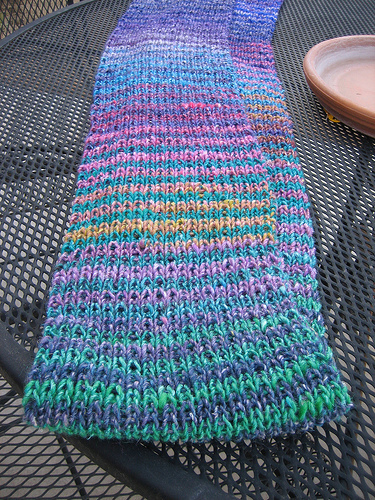 My lovely scarf ended up being a little over 8 feet long and I only had a tiny bit of yarn left over. 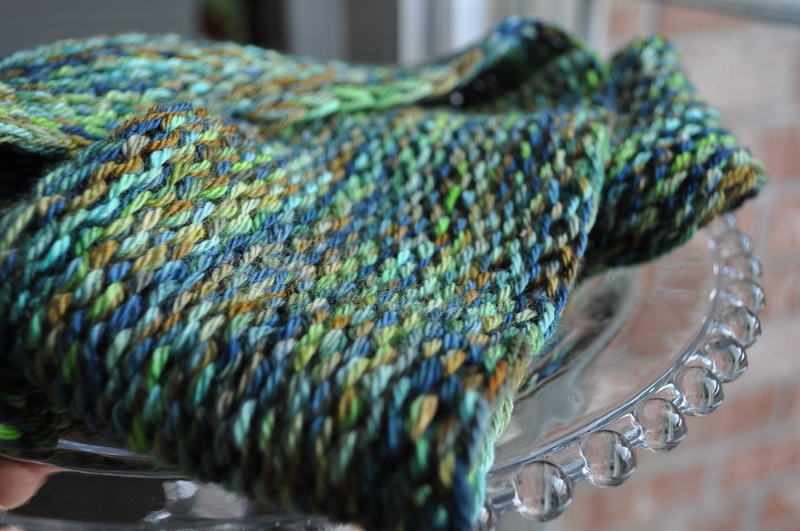 After being knit, my leaves looked quite wilted and wanted to curl up and disappear. 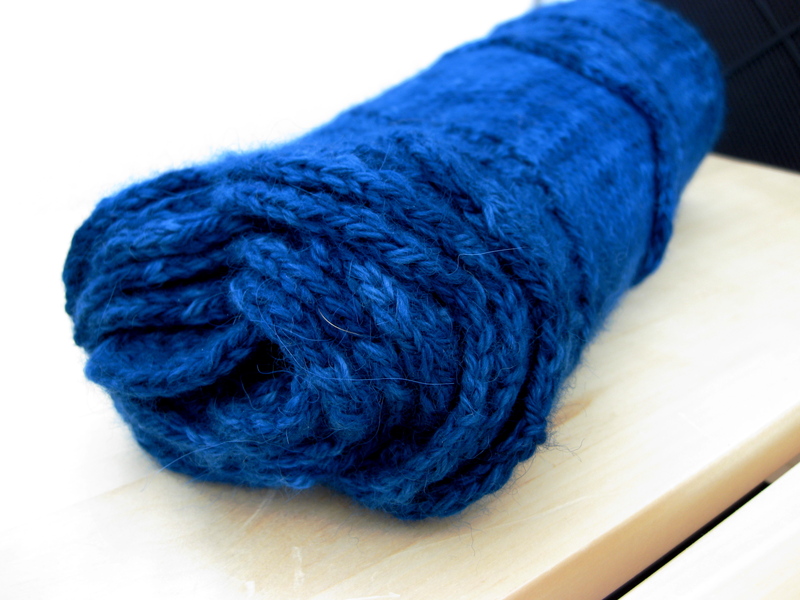 The rest of the scarf was also curling (what can you expect from stockinette after all), so I decided to use a damp washcloth and iron the thing! 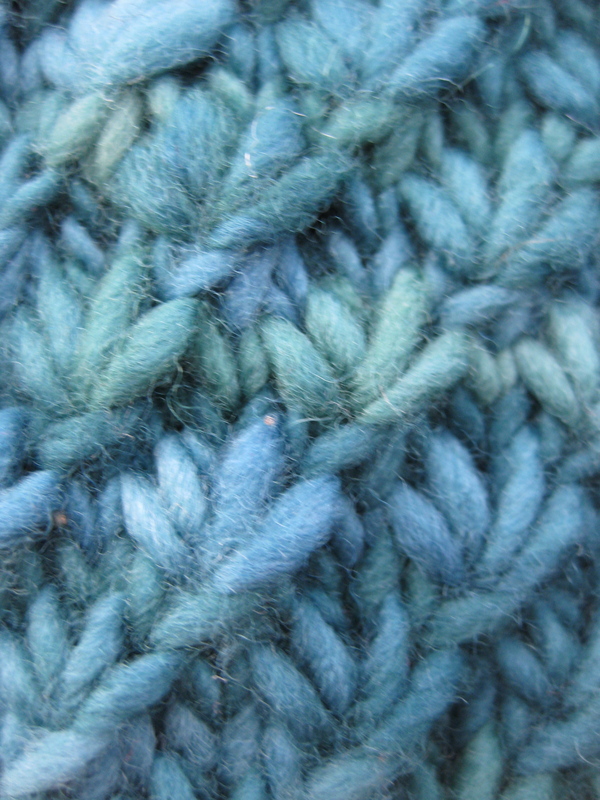 I got wonderful flat results, with perfectly planar leaves and lovely regular stitches. 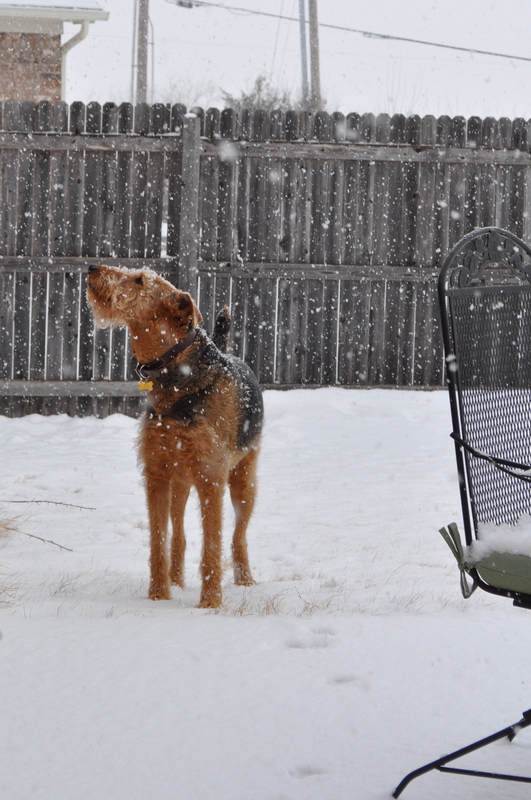 While I was knitting away on this project, Sasha’s mom decided she liked the pattern and started on her own. 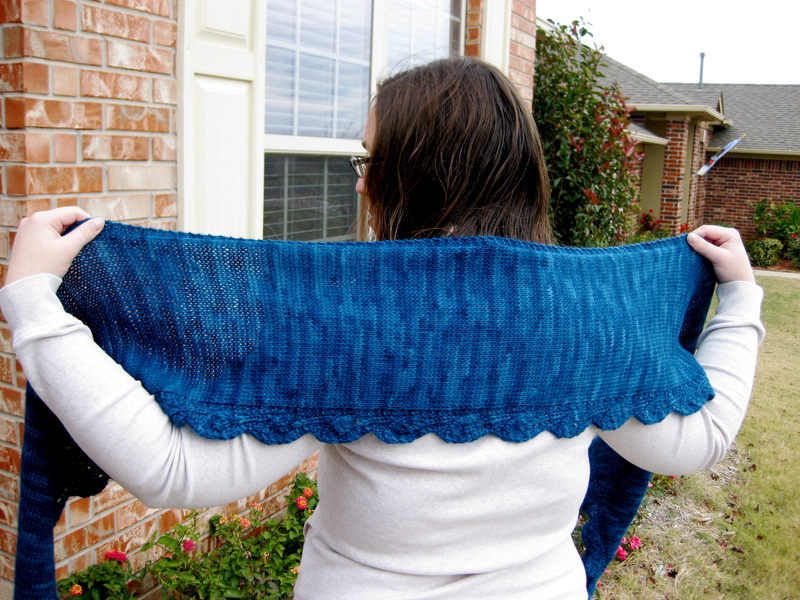 She was wanting more of a shawl and decided to increase more for a wider straight section and also work short rows at the shoulder so that the scarf/shawl/stole? would lay nicely. 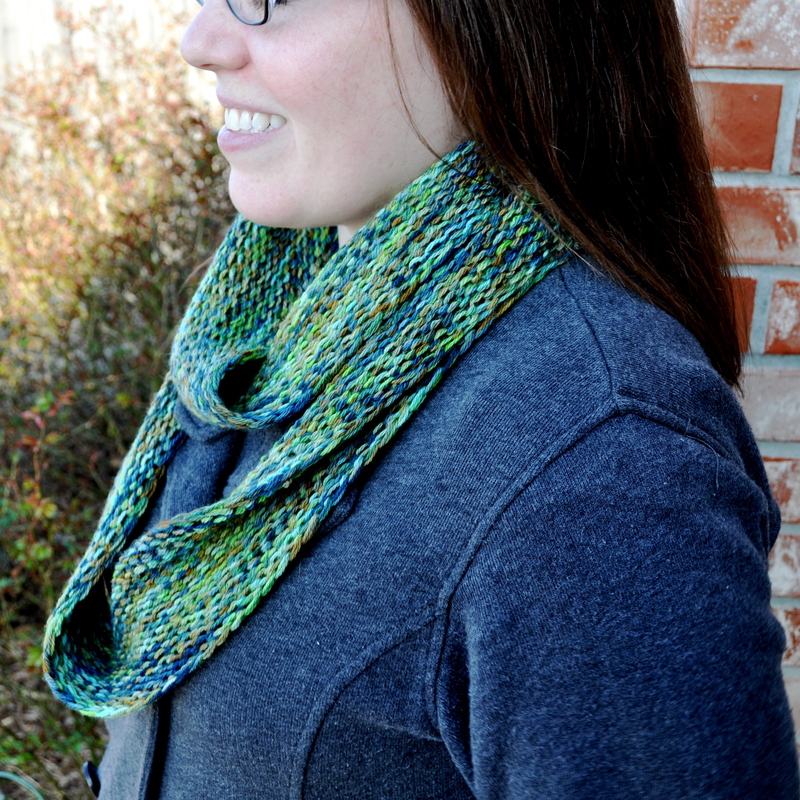 So there you have it – from the same pattern a long, gradually widening scarf and a wide shawl with shoulder shaping. 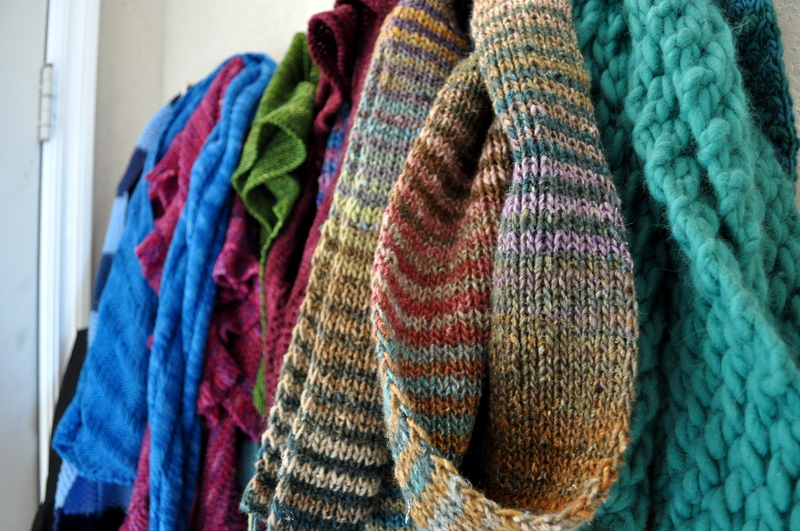 I love all of the different ways different knitters can use the same pattern! 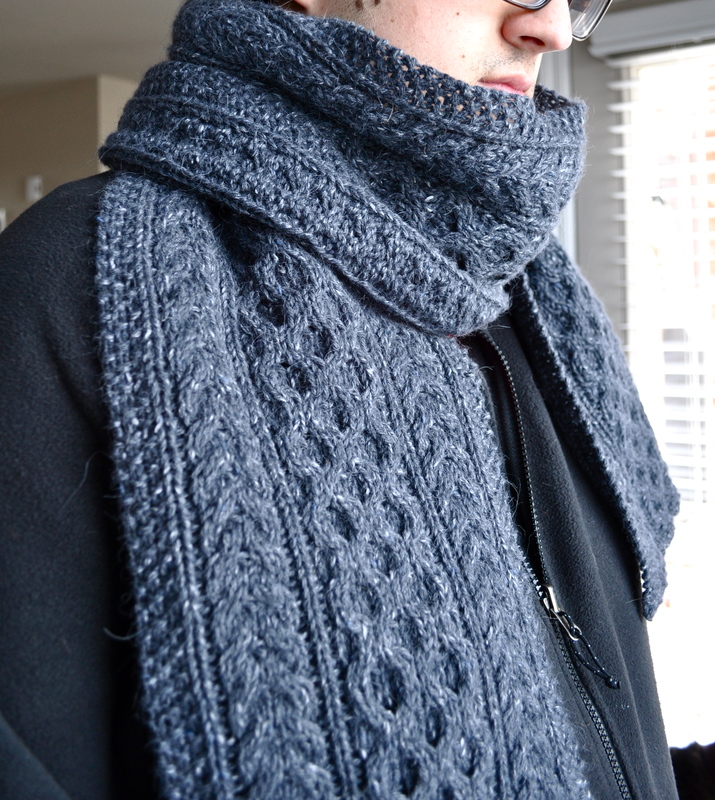 Oh, and did I mention that the pattern is one in a series based on one of my favorite shows, Bones? Perfect!